A roller coaster on Peak 8? BRECKENRIDGE – Breckenridge Ski Resort hopes to offer a new way to get down the hill. The resort has proposed to build an “alpine coaster,” a 2,500-foot-long ride on rails that could be used both summer and winter, possibly even at night. The proposed attraction would be located on Peak 8, above the Kids Castle, in a stand of lodgepole pine that now separate the Twister and Dyersville ski runs. Vail Resorts will go before the Breckenridge Planning Commission on Tuesday night to present the application for the coaster. According to Breckenridge spokesperson Kristen Petitt, the ride is similar to an alpine slide, except that its cars run on steel rails instead of a solid track. The cars would be propelled up the track to the launch point, much like those of a roller coaster. Riders would be strapped into the cars and would have the ability to control their speed. The resort hopes to operate the ride June 1 through Sept. 15 and early November through mid-April. The company plans to construct the ride this summer, pending approval by the Town of Breckenridge. The project would entail installation of about 3,000 feet of steel track, tree clearing on 0.6 acres, grading on 0.5 acres and construction of a 540-square-foot operations facility. 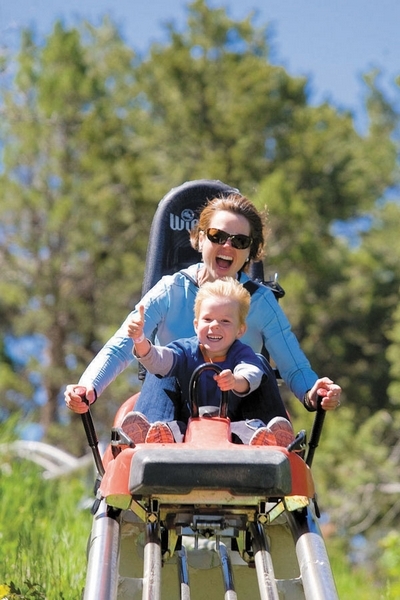 A similar mountain coaster currently operates in Glenwood Springs at the Adventure Park. Unlike the alpine slide currently at Breckenridge, a coaster-style slide runs on rails, not in a trough, and requires less earthwork to install – according to the website of Geise Engineering, which manufactures such slides. Another contrast to the alpine slide is that the coaster is fixed to the rail and cannot jump the track, as slides sometimes do with aggressive riders. Alpine coasters are also relatively quiet – much less so than the traditional roller coaster found at amusement parks.